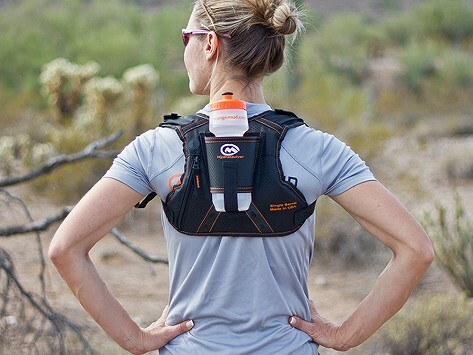 Ultralight, no bounce, bottle-based hydration pack. Perfect for carrying water and other essentials, such as energy bars, credit card, keys and more. Dimensions: 13" x 12" x 4"
I'm so pleased! For years my long runs end up lacking because I run out of hydration and electrolytes. The humidity and heat take their toll at mile 17 and there are often a few more miles to go. For three weeks now I have taken the hydraquiver out for the long runs and am elated. The night before the run I freeze both bottles half full, fill them the rest of the way before the run, and I'm set for at least 22 good miles. The bottles stay put, they are easy to reach if you have decent flexibility in the shoulders. There is little effort getting the bottle back in place. The padding is comfortable. I don't experience any chaffing. The straps need to be tight, but I find that helps with posture. I may try a little padding in the strap in the future, but right now I'm fine with the little sliding guards on the straps. The pocket is great for my phone. It has gone through the laundry 3 times now and shows no wear. All products are Made in America within 100 mile radius of Josh’s Southern California headquarters.